"States of America" redirects here. For the sovereign states of the Americas, see List of sovereign states and dependent territories in the Americas. For a broader coverage related to this topic, see U.S. state and Territories of the United States. The United States of America is a federal republic consisting of 50 states, a federal district (Washington, D.C., the capital city of the United States), five major territories, and various minor islands. 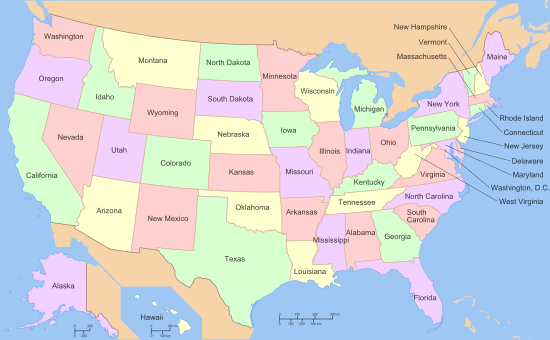 The 48 contiguous states and Washington, D.C., are in central North America between Canada and Mexico; the two other states, Alaska and Hawaii, are in the northwestern part of North America and an archipelago in the mid-Pacific, respectively, while the territories are scattered throughout the Pacific Ocean and the Caribbean Sea. States are the primary subdivisions of the United States, and possess a number of powers and rights under the United States Constitution, such as regulating intrastate commerce, running elections, creating local governments, and ratifying constitutional amendments. Each state has its own constitution, grounded in republican principles, and government, consisting of three branches: executive, legislative, and judicial. All states and their residents are represented in the federal Congress, a bicameral legislature consisting of the Senate and the House of Representatives. Each state is represented by two Senators, while Representatives are distributed among the states in proportion to the most recent constitutionally mandated decennial census. Additionally, each state is entitled to select a number of electors to vote in the Electoral College, the body that elects the President of the United States, equal to the total of Representatives and Senators in Congress from that state. Article IV, Section 3, Clause 1 of the Constitution grants to Congress the authority to admit new states into the Union. Since the establishment of the United States in 1776, the number of states has expanded from the original 13 to the current total of 50, and each new state is admitted on an equal footing with the existing states. As provided by Article I, Section 8 of the Constitution, Congress exercises "exclusive jurisdiction" over the federal district, which is not part of any state. Prior to passage of the 1973 District of Columbia Home Rule Act, which devolved certain Congressional powers to an elected mayor and council, the district did not have an elected local government. Even so, Congress retains the right to review and overturn laws created by the council and intervene in local affairs. As it is not a state, the district does not have representation in the Senate. However, since 1971, its residents have been represented in the House of Representatives by a non-voting delegate. Additionally, since 1961, following ratification of the 23rd Amendment, the district has been entitled to select three electors to vote in the Electoral College. In addition to the 50 states and federal district, the United States has sovereignty over 14 territories. Five of them (American Samoa, Guam, the Northern Mariana Islands, Puerto Rico, and the U.S. Virgin Islands) have a permanent, nonmilitary population, while nine of them do not. With the exception of Navassa Island, Puerto Rico, and the U.S. Virgin Islands, which are located in the Caribbean, all territories are located in the Pacific Ocean. One territory, Palmyra Atoll, is considered to be incorporated, meaning the full body of the Constitution has been applied to it; the other territories are unincorporated, meaning the Constitution does not fully apply to them. Ten territories (the Minor Outlying Islands and American Samoa) are considered to be unorganized, meaning they have not had an Organic Act enacted by Congress; the four other territories are organized, meaning they have had an Organic Act that has been enacted by Congress. The five inhabited territories each have limited autonomy and a non-voting delegate in Congress, in addition to having territorial legislatures and governors, but residents cannot vote in federal elections. California is the most populous state, with 38,332,521 residents (2013 estimate); Wyoming is the least populous, with an estimated 582,658 residents. The District of Columbia, with an estimated 646,449 residents as of 2012, has a higher population than the two least populous states (Wyoming and Vermont). The largest state by area is Alaska, encompassing 665,384 square miles (1,723,340 km2), while the smallest is Rhode Island, encompassing 1,545 square miles (4,000 km2). The first state to ratify the current Constitution was Delaware, which it did on December 7, 1787, while the newest state is Hawaii, which was admitted to the Union on August 21, 1959. The largest territory in terms of both population and size is Puerto Rico, with 3,725,789 residents as of the 2010 Census and a total area of 5,325 square miles (13,790 km2). ^ The largest city is the city in a state with the largest population in the city proper (as opposed to metropolitan area). ^ Each state is entitled to at least one representative. Current federal law sets the number of voting members of the House of Representatives at 435, which are apportioned among states every ten years according to their relative population. Each state is also entitled to two senators. ^ a b c d Uses the term "commonwealth" rather than "state" in its full official name. ^ Officially the "State of Rhode Island and Providence Plantations". ^ a b c d e Represented by a non-voting delegate in the House of Representatives. ^ 2015 population estimate for: American Samoa, Guam, Northern Mariana Islands, and Virgin Islands; 2017 population estimate for Puerto Rico. ^ Although not organized through a federal organic act or other explicit Congressional directive on governance, the people of American Samoa adopted a constitution in 1967, and then in 1977, elected territorial officials for the first time. ^ a b Organized as a commonwealth. ^ Represented by a non-voting resident commissioner in the House of Representatives. ^ Although there are no indigenous inhabitants, around 40 United States Fish and Wildlife Service staff and service contractors live on the island at any given time. ^ U.S. sovereignty is disputed by Haiti. ^ Although there are no indigenous inhabitants, between four and 20 Nature Conservancy, employees, United States Fish and Wildlife Service staff, and researchers live on the island at any given time. ^ Although there are no indigenous inhabitants, as of 2009, around 150 U.S. 150 U.S. military personnel and civilian contractors were living on the island, staffing the Wake Island Airfield and communications facilities. ^ U.S. sovereignty is disputed by the Republic of Marshall Islands. ^ This is the approximate figure for the land area of the bank, and does not include the surrounding territorial waters. ^ This figure includes the total land area of the Serranilla Bank and the water area of its lagoon, but not the surrounding territorial waters. ^ Burnett, Kristin D. "Congressional Apportionment (2010 Census Briefs C2010BR-08)" (PDF). U.S. Department of Commerce, Economics and Statistics Administration. Archived from the original (PDF) on November 19, 2011. ^ "Doctrine of the Equality of States". Justia Law. Retrieved June 16, 2017. ^ "DC Home Rule". Council of the District of Columbia. Archived from the original on November 17, 2011. ^ "The Permanent Apportionment Act of 1929: June 11, 1929". Washington, D.C.: Office of the Historian, United States House of Representatives. Retrieved February 28, 2018. ^ "The Senate and the United States Constitution". www.senate.gov. Washington, D.C.: Secretary of the Senate. Retrieved February 28, 2018. ^ a b c "Appendix B: Two–Letter State and possession Abbreviations". Postal Addressing Standards. Washington, D.C.: United States Postal Service. May 2015. Retrieved March 3, 2018. ^ a b c "Annual Estimates of the Resident Population: April 1, 2010 to July 1, 2017". Washington, D.C.: U.S. Census Bureau, Population Division. December 2017. Retrieved March 3, 2018. ^ a b c d e f g h i "State Area Measurements and Internal Point Coordinates". Washington, D.C.: U.S. Census Bureau. Retrieved March 3, 2018. ... provides land, water and total area measurements for the 50 states, the District of Columbia, Puerto Rico and the Island Areas. The area measurements were derived from the Census Bureau's Master Address File/Topologically Integrated Geographic Encoding and Referencing (MAF/TIGER®) database. The land and water areas, ... reflect base feature updates made in the MAF/TIGER® database through August, 2010. ^ "State and Local Government Finances and Employment" (PDF). United States Census Bureau. 2012. p. 284. Archived from the original (PDF) on October 17, 2011. Retrieved July 8, 2013. ^ "The History of Washington, DC". Destination DC. March 15, 2016. Retrieved March 3, 2018. ^ a b "Directory of Representatives". Washington, D.C.: U.S. House of Representatives. Retrieved March 5, 2018. ^ a b "Definitions of Insular Area Political Organizations". Washington, D.C.: U.S. Department of the Interior. June 12, 2015. Retrieved March 1, 2018. ^ "American Samoa". The World Factbook. Central Intelligence Agency. Retrieved July 9, 2013. ^ a b "Islands We Serve: American Samoa". Washington, D.C.: U.S. Department of the Interior. June 11, 2015. Retrieved March 1, 2018. ^ "Guam". The World Factbook. Central Intelligence Agency. Retrieved July 9, 2013. ^ a b "Islands We Serve: Guam". Washington, D.C.: U.S. Department of the Interior. June 11, 2015. Retrieved March 1, 2018. ^ "Northern Mariana Islands". The World Factbook. Central Intelligence Agency. Retrieved July 9, 2013. ^ "Puerto Rico". The World Factbook. Central Intelligence Agency. Retrieved July 9, 2013. ^ "Virgin Islands". The World Factbook. Retrieved July 9, 2013. ^ "Islands We Serve: Virgin Islands". Washington, D.C.: U.S. Department of the Interior. June 11, 2015. Retrieved March 1, 2018. ^ a b "Baker Island". Office of Insular Affairs. Archived from the original on April 19, 2012. Retrieved July 9, 2013. ^ "Jarvis Island". Office of Insular Affairs. Archived from the original on February 7, 2012. Retrieved July 9, 2013. ^ "Johnston Island". Office of Insular Affairs. Archived from the original on March 14, 2012. Retrieved July 9, 2013. ^ "Kingman Reef National Wildlife Refuge". United States Fish and Wildlife Service. Retrieved July 9, 2013. ^ a b "United States Pacific Islands Wildlife Refuges". The World Factbook. Central Intelligence Agency. Retrieved October 10, 2014. ^ "Midway Atoll". Office of Insular Affairs. Archived from the original on February 4, 2012. Retrieved July 9, 2013. ^ "Navassa Island". Washington, D.C.: U.S. Department of the Interior. June 12, 2015. Retrieved March 3, 2018. ^ "Palmyra Atoll". Office of Insular Affairs. Archived from the original on January 11, 2012. Retrieved July 9, 2013. ^ a b "Wake Island". The World Factbook. Central Intelligence Agency. Retrieved October 10, 2014. ^ Earnshaw, Karen (December 17, 2016). "Enen Kio (a.k.a. Wake Island): Island of the kio flower". Marshall Islands Guide. Majuro, Republic of the Marshall Islands. Retrieved March 4, 2018. ^ a b c Lewis, Martin W. (March 21, 2011). "When Is an Island Not An Island? Caribbean Maritime Disputes". GeoCurrents. Retrieved June 16, 2017. ^ "Cayo Serranilla" (in Spanish). Eco Fiwi. Retrieved June 16, 2017. Wikimedia Commons has media related to Subdivisions of the United States. This page was last edited on 16 February 2019, at 05:46 (UTC).